Up until 2017, I'm almost positive that Panhandler's was Fort Collins oldest operating Pizza restaurant, opening back in 1975. When I was a kid, they had two Fort Collins stores throughout the 70s and 80s. 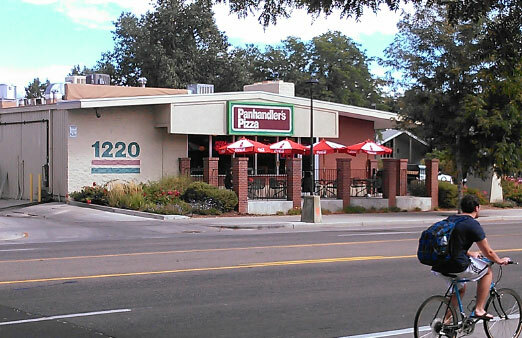 Their original store was located in the "Campus West" area on Elizabeth Street near Colorado State University. The other was located on the east end of town in the old Scotch Pines Village shopping center. 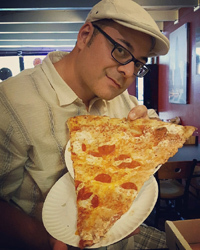 Prior to my final visit, I believe the last time I enjoyed a slice of Panhandler's pizza was in 1987 or 1988 when I was in high school. Panhandler's would set up in the park directly across from the old Fort Collins High School one day a week for an event called "Pizza in the Park". They would sell their thick pan pizza for $1.00 a slice, and one slice was a meal in itself. About a year and a half ago, I did an internet search to see if they were still in business. I learned that their original store on Elizabeth was still open and going strong. During a trip to Fort Collins, I decided to pop in to see if their pizza was all I remembered it to be. I was so happy to learn that Panhandler's pie was indeed every bit as good as I remembered. I arrived for lunch at 11:00 a.m. when hot pies were coming right out of the oven. 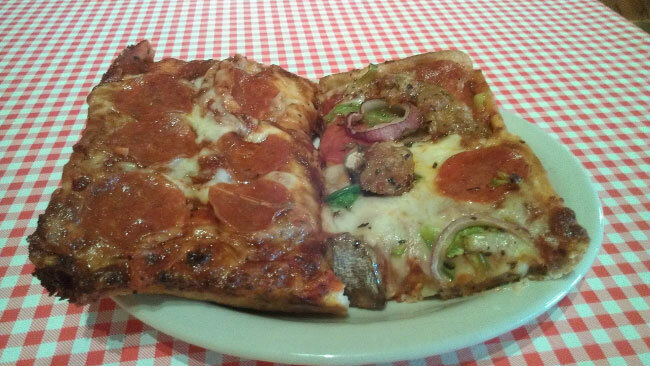 I chose a Pepperoni slice, and Deluxe Combo slice which sported Italian Sausage, Pepperoni, Mushroom, Green Pepper & Red Onion. Made in house daily, the quality of Panhandler's dough was very evident. The Panhandler's method of cooking their pan style crust took 25 minutes. This cook time resulted in the pastry-like dough being fully cooked through and through, and was by no means thick and chewy like many pan styles I had tried over the years. Panhandler's was famous in the area for their Honey Whole Wheat pan crust. Honey dispensers were abundant and readily available for patrons. That way, upon finishing your slice, you could dip the honey wheat crust edges into some honey for a sweet and satisfying treat. Panhandler's sauce was made fresh daily right on the premises. With the amount of crust on this type of pie, you need a sauce that brings a lot to the table, and Panhandler's sauce did not disappoint. The sauce was snappy and hit you right up front. It wasn't overpowering however, and jived perfectly with the slice until the very last bite. Panhandler's pies were made with 100% real, Wisconsin whole-milk Mozzarella cheese. The other toppings were top notch, being of good quality and thick cut with exception of the pepperoni. Proportions of all toppings in relation to the sizing of these slices was always spot on. A nice slice of pan pizza is a thing of beauty, and a slice of Panhandler's Pizza was impressive to say the least. Caramelized edges, beautiful cheese, liberal toppings, and the sheer size of those slices made for a beautiful looking slice all the way around. At the time of my visit, the restaurant was exactly the way I remembered it. 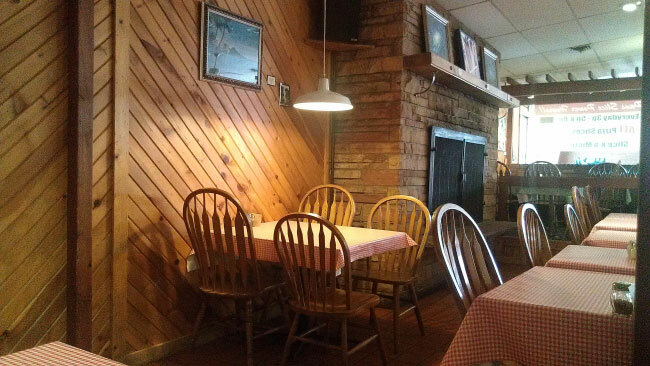 The pizzeria exuded a warm and rustic Colorado feel, and had a great layout for accommodating large groups of people. Dated? Some might've said so, but to me it looked exactly how it should. I remember visiting this very restaurant once in the dead of a cold Colorado winter. We looked out of the front window, only to see a wall of thick white snow blowing around like crazy. After an initial groan from everyone, the angst faded and pretty soon the storm didn't matter to any of us. There was a nice warm fire burning in the fireplace, hot pizza on the table, and pitchers of root beer flowing like water. It felt safe and soothing, my own version of paradise, and I never wanted to leave. It was one of the greatest memories of my pizza laden youth. At the end of 2017, I learned from my peeps back in Colorado, that the restaurant closed its doors after 42 years. This saddened me to no end, but my friends told me not to fret because they would relocate and reopen under new ownership. They have indeed done just that, with the new digs sporting an industrial design. Apparently there's a very microbrewery feel to it, with the centerpiece of the restaurant being a bar. I've seen pictures of the new restaurant, and I just couldn't get excited about the new transfer of ownership and rebranding. I've seen many pizzerias transfer ownership in my time, and I can attest that they are never the same afterwards. Recipes may transfer, and the product can still be good, but they're simply not the same in many ways. I mean how can they be? Every pizzeria has its own soul and its own culture. And.. with new owners and staff, comes a whole new blueprint that simply cannot be a carbon copy of the last one. I wish the new Panhandler's nothing but the best, and I hope the pizza will have a semblance of what it used to be. And.. If I have time, I will definitely stop in to do a review on my next visit to Fort Collins. Times change, and it can sometimes be bittersweet or downright sad. I am happy however, that I had a chance to eat at the old Panhandler's one last time before it closed. If nothing else, I've got a couple decades of great memories and stories to look back on, and I will always do so fondly.